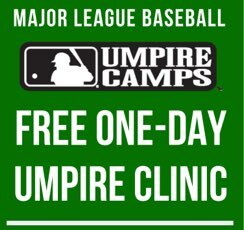 Public Service Announcement time for umpires: MLB will host a free one-day Umpire Camp/clinic August 18 at Minute Maid Park in Texas, home of the Houston Astros. The League has a registration form available for this MLBUC, at this link, but even if you don't pre-register, walk-ups are always welcome. For aspiring professional umpires, the MLB Umpire Camps offer the potential for an invitation to the MLB Professional Mini-Camp in Florida, which in turn offers its highest prospects scholarships to umpire school—either Wendelstedt's or MiLB's Academy. In 2017, 22 MLB Umpire Camp clinic participants received invites to Mini-Camp and 10 of the Mini-Camp attendees received scholarships to school. Over the course of the program, which dates back to 2006, MLB says that 130 Umpire Camp (clinic) attendees have advanced to work in professional baseball. To register for the August 18, 2018 clinic in Houston, click here.